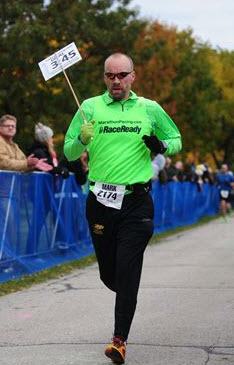 This was my 5th official race as a pacer and this was as enjoyable as the others. I get to help people achieve their goals, I work on my own even pacing, (something everyone needs practice with) and I also got a great weekend with Misty. This was also the first marathon I have ever run in minimalist shoes, and so it marked the beginning of a new era in my running career. The race being in Milwaukee on a Sunday morning meant Misty and I left Michigan Saturday morning, timing it such that we would have a few hours free in Wisconsin before I had to be at the race expo. 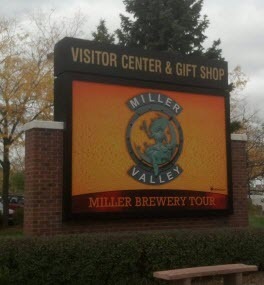 With our packed lunches we were free to do ‘whatever’ and after some discussion, we decided this year (last year we went to the art museum) that we would go to the Miller-Coors brewery and take the tour of one of the oldest breweries in the country. They had a slick video and well scripted tour guide that emphasized all the good things about the history of the company and didn’t mention some of the dark sides. No great surprise in that. After a few glasses of free beer, Misty dropped me off at the expo while she went to the Mayfair mall. My job was as usual for expos, talking to runners about what the job of the pacing crew was, how to run the race smart, what to do the last 18 hours before the gun, etc. With a good crew of fellow pacers and lots of runner questions, my 2 hour time shift went by fast. The expo itself was small and relatively unexciting, but for me that seemingly describes every expo. With the race starting at 7:30 am, the pacers were on the bus by 6 am for the drive to the start line at Grafton High School, mere miles away from where my father grew up. It was gonna be cold and since I was going to be running slower than my normal pace, I loaded up on clothes complete with a -pair- of gloves. I say that because somewhere between the high school and the gun I lost one of my gloves. They were cheap throw-away kids size knit ones you can get for $1 so I wasn’t sad, but annoyed as somewhere during last minute costume changes and running off to empty my bladder multiple times during the last 20 minutes I lost one of them. At about mile 5, one of the runners in my pack asked me if I wanted a glove. She was wearing these bright green kids size knit gloves and said that she was going to ditch them anyways so I took one of them. 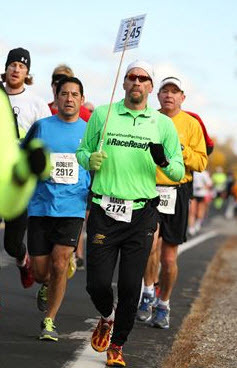 I ran the rest of the race with one black glove and one lime green glove. Only Misty seemed to notice at the end of the race. With over 2000 finishers, there was quite the crowd at the starting line, including about 100 people who began the race following me and my 3:45 sign. The weather was just this side of perfect with a light breeze at our back, partly cloudy skies and temperatures in the mid 40s all day long. To give you an idea of how perfect the race conditions were, the Chicago Marathon was held the same day a few hours south of us and a course record was set. Beautiful. I waited until a few miles into the race with the crowd spaced out a bit before I gave my standard pacer briefing to my runners. How we were going to run even pace all day long, how we deal with water stations and tell them the incentive that if they make it to mile 18, they get to hear the one really funny jokes I know. As we passed each mile marker, I would check the elapsed time against the pace chart and determine how many seconds difference between the two. Negative numbers meant we were under our projected time, positive meant we were over. For the first 13 miles, theat number fluctuated between -5 and +8. That is pretty much as even pace as you can get. At the half-marathon mark I still had a solid crew of 15 people, including several people who were gunning for Boston qualifying (BQ) times as well as personal record (PR) times. In the end, there would be 2 BQ’s and 3 PR set by my runners, a better track (ha!) 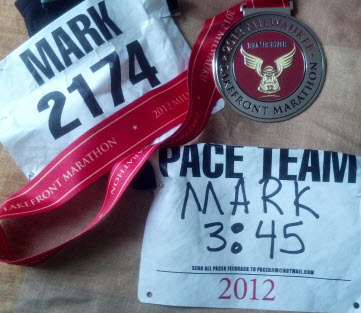 record than my previous paced marathoners. I was doing just fine keeping even pace until a long downhill section at mile 23 which caused me to speed up a little more than I had wanted to. My crew took off in front of me as they were running a more natural race pace, meaning they sped up on the downhill. At the bottom I adjusted my pace a little to get back into my time window, wanting to cross the finish line in the 15 second space between 3:44:45 and 3:45:00. During my ‘gentle’ running of miles 24-26, a few people who had been running with me earlier and dropped back before the hill caught up with me and even passed me, which as a pacer, is a great thing. You actually want to see people you have been running with all day pull ahead of you. I crossed the finish line right on schedule, 8 seconds under the time on my sign. While none of my runners were right next to me, a few of those who finished before me stayed to thank me, which was just totally cool. The post race operation was wonderful, a bag of food, a huge finishers medal and some more free beer (I love Milwaukee) along with hundreds of happy finishers faces all around made for a great moment. Seeing my lovely wife waving at me with her happy smile made it even better. We had a pleasant walk back to the hotel and after a quick shower, we headed back home after yet another wonderful weekend. A free marathon and kid-free weekend with my wife, umm yeah, I’ll take it anytime you offer it.